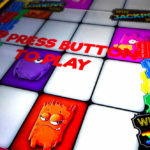 Monster Smash Arcade Game is another addition to our growing selection of “puzzle” games rental. 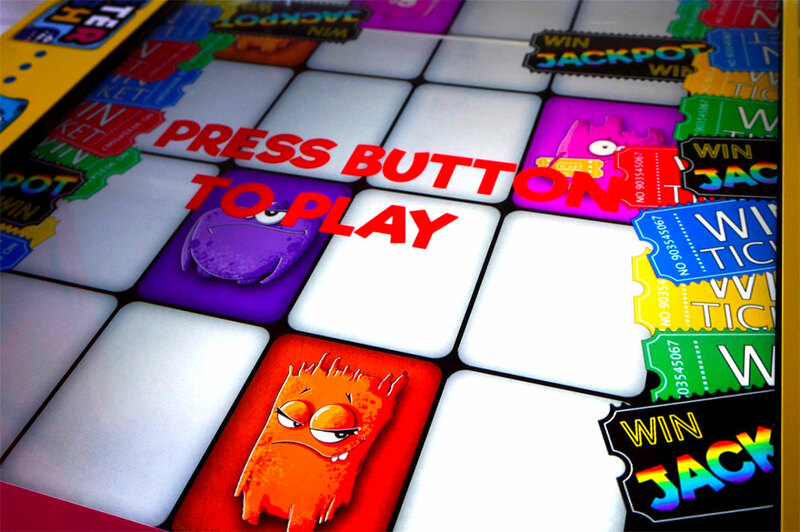 Together with the Strike a Light, Speed of Light and Catch the Light, Video Amusement offers the largest selection of “puzzle” games anywhere in California! Monster Smash Arcade Game is truly a rare find. The minute we saw the game play, we fell in love with this colorful and sleek game. The game is a high-energy fast paced game where hand and eye coordination is very important. The rented Monster Smash Arcade Game comes in a beautiful colorful cabinet with astonishing sound system, 42 inch flat screen LCD and LED lighting, that can be customized to your color theme or just simply let the light cycle automatically as the game is being played. 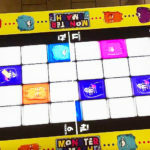 The object of the rented Monster Smash Arcade Game is to smash the colorful blocks with monster coming down the screen. 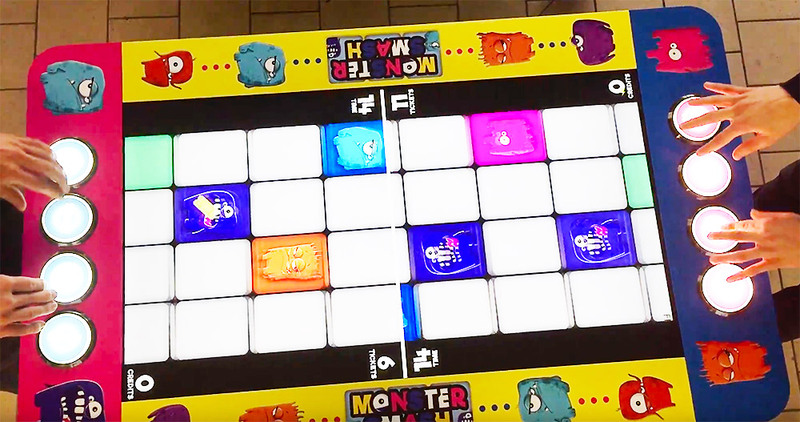 The players are using 4 buttons on each side of the game cabinet at the end of the moving line where the colorful blocks with the monsters are terminating. The faster you smash, the faster the blocks are moving toward you. Hand and eye coordination and of course concentration is very important, since the average game lasts about 60 seconds. The game time skill levels are adjustable. The Monster Smash Arcade Game can be played as a single player against the computer. Or in a competition head to head mode against your opponent. During the game the scores are recorded. The final score with your ranking and the stats of your speed is displayed on the screen. 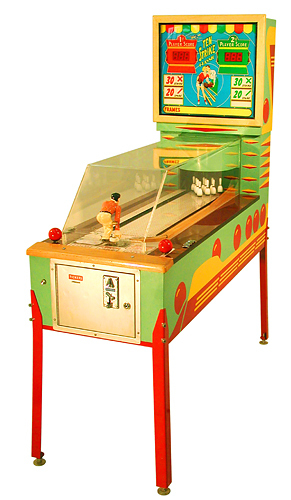 The game can be also setup to display the high score of the day. This will encourage a friendly challenge among the friends and co-workers. Monster Smash Arcade Game rental is a perfect addition to any party, event, graduation, bar/bat mitzvah, convection or a trade show. 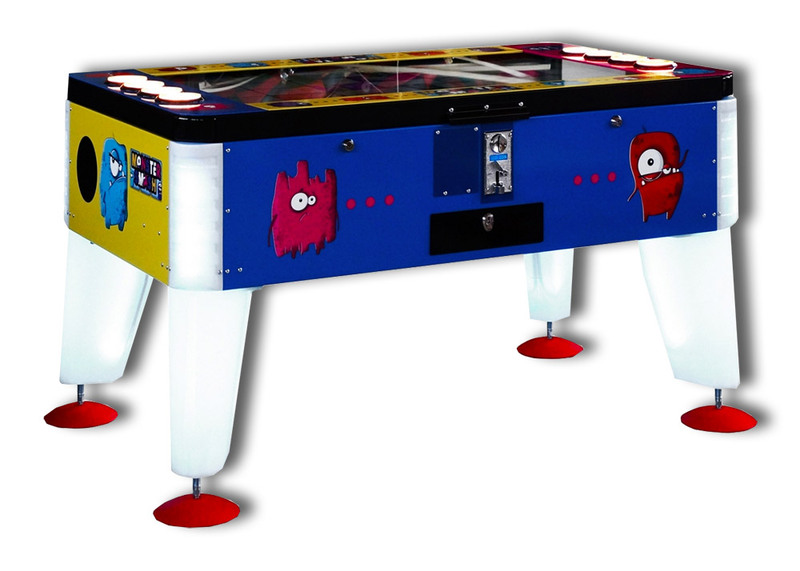 Monster Smash Arcade Game is a great game for a corporate break room or office on a long-term rental and lease. Puzzle games are proven to be the best games for employee relaxation and stress relieve. With our largest selection of arcade games and pinball machines your break room will be always fresh and exiting place to visit. Video Amusement delivers rented Monster Smash Arcade Games in California, San Francisco, San Jose, Santa Clara, Santa Cruz. Palo Alto, Monterey, Salinas, Sacramento, Los Angeles, San Diego, Silicon Valley, East Bay. Central Coast and Bay Area cites as well Las Vegas Nevada and entire West Coast. Let’s have fun and party with Monster Smash Arcade Game!